The International City Star was introduced in 2004 and is available in two versions namely the CF500 and CF600. 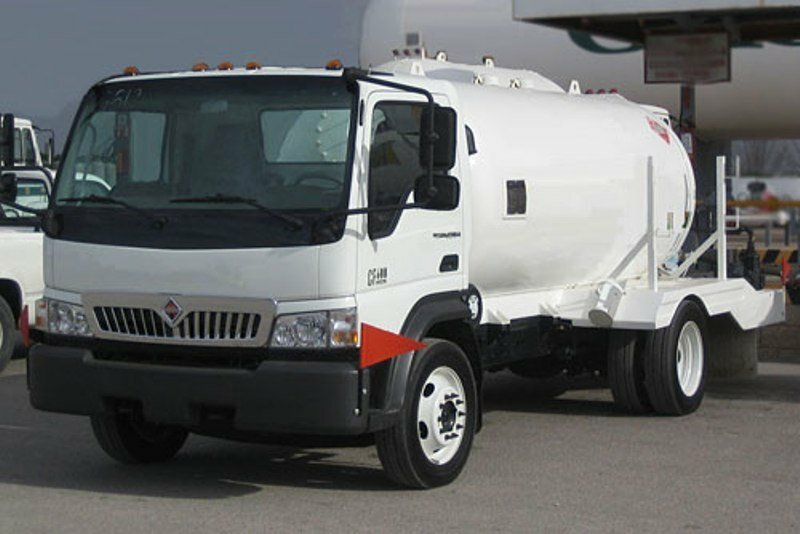 The truck features a cab over engine configuration and was designed as a class 4 medium duty vehicle with a GVW (gross vehicle weight) rating of up to 19.500 lbs. The International CityStar can be used for a wide range of medium duty applications and its relatively compact dimensions give it a high maneuverability around the narrow city streets. Under the cab, the truck is equipped with International’s VT 275 4.5-liter V6 diesel engine which offers a maximum output of 200 hp and is mated on a five speed automatic transmission. The truck features a cab over engine configuration which is usually typical for the European market. The overall design is pretty simple and suits the utilitarian character of the truck. The vertical front fascia features a small chromed radiator grille which bares the company’s diamond logo and is traversed by a few vertical stripes. The truck is also fitted with a pretty rudimentary front bumper which serves as a base for the similarly simple headlights which sit on both sides of the grille. Viewed from the side, the CityStar features breakaway mirrors, with dual 8 x 6 inch convex lenses included. We like the sloping line of the door windows as they improve the side visibility and also add a dose of dynamism to an otherwise utilitarian appearance. The truck sits on 19.5 inch wheels shod in 225/70R19.5 tires. The International CityStar is pretty easy to maintain as it features a full-tilt cab which offers easy access the service points. Climbing in and out of the cabin is pretty easy, thanks to the well-positioned grab handles and a large first step that’s low to the ground. There is plenty of space inside and you also have acres of head- and legroom. As it was expected, the materials are rock-hard and the build quality is also bit poor, as the fit and finish can’t be compared with other trucks in the segment. 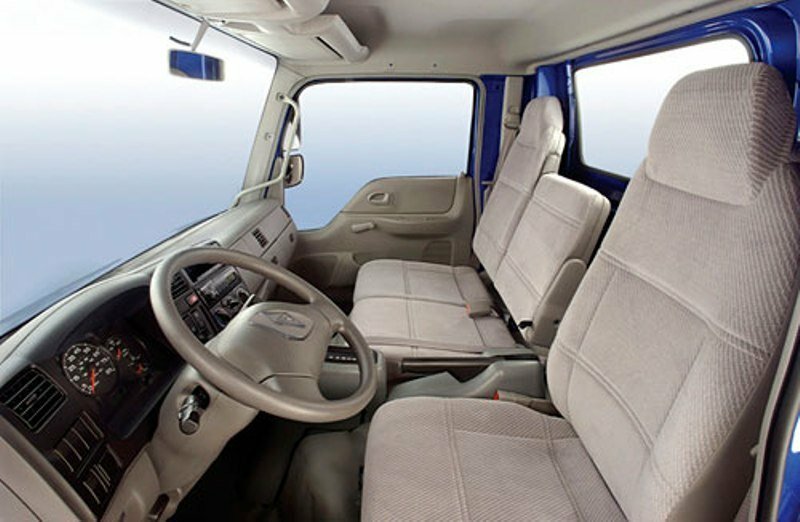 The dashboard has a conventional design without the typical wraparound style found at most of today’s trucks. Though, you won’t have any problems to reach the controls as they are within easy reach and have an intuitive layout. The instrument cluster features three main gauges that are easy to read and a small rectangular display which shows different vehicle information. The cabin can accommodate up to three persons, but the middle passenger seat comes without a headrest as it folds down into forming a flat work surface. The seats are a bit flat and lack any lateral support, but at least they can be adjusted permitting you to find a less uncomfortable driving position. Luckily the standard tilting and telescoping steering wheel offers more convenience. It has relatively small dimensions which make it unobtrusive and fairly easy to use. We also like the commanding view of the road and the capable heating, venting, air-conditioning and defrosting which add some common sense comfort into this utilitarian cabin. Needless to say that the storage spaces abound and besides the typical door pockets and the large cup holders, the truck is also fitted with overhead storage boxes and dual glove compartments. The truck is equipped with the International VT 275 engine. The unit develops 200 hp @ 2700 rpm with a peak torque of 440 lb-ft @ 1800 rpm. While the engine’s output is far from being the strongest in the business, its torque is more than enough to effortlessly merge with freeway traffic and to offer lively performances around town. The VT engine features four valves per cylinder for enhanced airflow and is also fitted with the company’s Electro- Hydraulic Generation Two (G2) fuel injection system for enhanced performances and a lower fuel consumption. Another useful feature is the two-stage turbocharger that offers quick response at low speeds and increased power at higher rpms. There is also available an electronically controlled cooled Exhaust Gas Recirculation (EGR) system for compliance with clean air standards. The engine is mated on a 5-speed overdrive automatic transmission which includes a tow/haul mode and is available with or without a PTO (power take off) gear. The front suspension use a Taperleaf configuration with shock absorbers and a front stabilizer bar, while the rear gets single variable-rate suspensions with auxiliary rubber springs and shock absorbers. The ride isn’t something to rave about, but the shock absorbers leave only the biggest bumps to make their way into the cab offering a pretty forgivable journey. 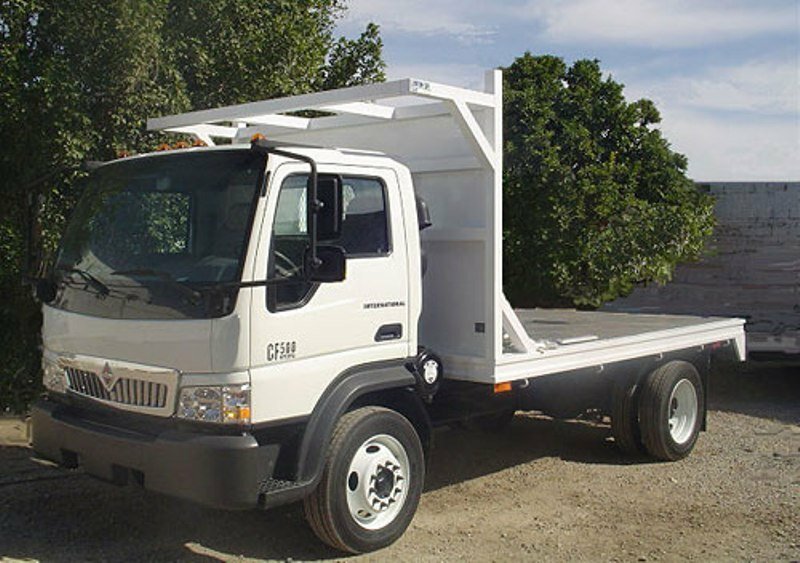 The CF Series frame is made of high-strength low-alloy steel which can accommodate a wide range of bodies and equipments for vocations such as pickup and delivery, beverage, utility, recovery and construction. Thanks to a light and responsive steering which is combined with the cab over engine configuration and a tight turning radius the International CityStar can be maneuvered with ease even on the tightest roads without too much drama. The stopping powered is average and is assured by hydraulic 4-wheel disc brakes with ABS. The CityStar’s chassis can be converted for a wide range of application, but unlike other trucks in the segment which come with a longer list of engines, the International truck is available with only one option which limits its versatility. On the other hand, the engine can deal effortless even with the biggest payloads and is also pretty efficient and reliable. The cabin looks a bit dated and dull, with a pretty poor built quality, but except for the flat seats its overall ergonomy is fairly good and everything is within easy reach. The truck is also pretty cheap and easy to maintain and even its not the most reliable model in the business it’s still able to make a compelling case for itself.